Approximately 25 million Americans suffer from gastrointestinal (GI) mucosal complaints at some point in their lifetime. Such discomfort was originally thought to arise from stress, spicy foods, alcohol consumption, gastric acid production or heredity. Today, it is known that common bacteria from food is often the root cause. Since almost 80% of pathogens enter the body either through mucosal tissue or stay localized on mucosal surfaces, a healthy mucosal lining is of the utmost importance for digestive health. DGL, or deglycyrrhizinated licorice, is a form of licorice root that has been specially processed to contain only biologically active flavonoids, without glycyrrhizin. The deglycyrrhized form of licorice allows for higher dosing of supportive flavonoids, which helps maintain a healthy mucosal barrier in the stomach and intestines. Traditionally used to support GI-related complaints, research has shown DGL to promote bacterial balance and protect the renewal of the intestinal lining. Along with DGL, this tablet also contains aloe vera, slippery elm bark and marshmallow root, all used to soothe and relieve minor pain and discomfort in the GI tract. 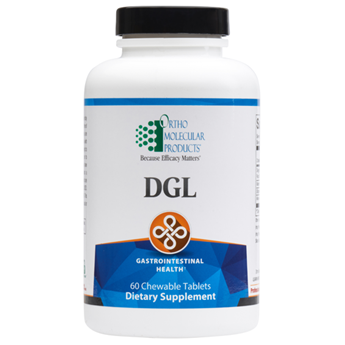 Each each pleasant-tasting, chewable tablet of DGL contains 500 mg DGL per serving.